Just a few weeks back, we were all glued to the TV as we watched Usain Bolt win three Gold medals at the Olympics. 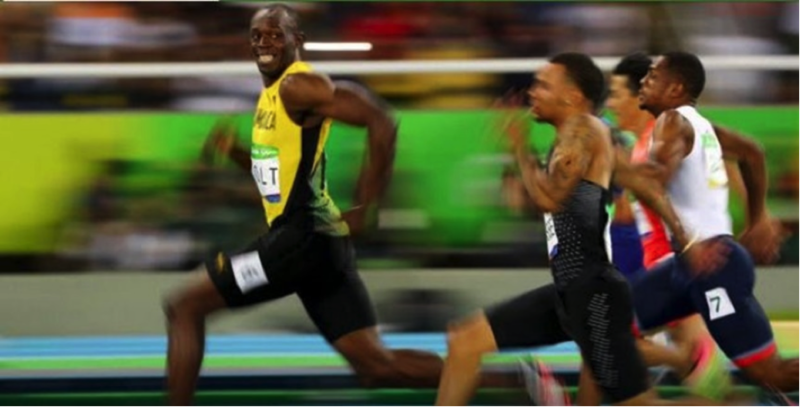 The snapshot that went around the world had Bolt smiling at the camera while pacing ahead of the fastest runners in the world, seemingly at ease and having fun. The image is actually a good metaphor of what happens today in businesses all over the world, in every industry and category; a new emerging generation of leaders isn’t satisfied with simply competing. These leaders set themselves apart by reimagining the future of businesses, industries, and categories. They redefine what value means to consumers and transform customer expectations. These leaders re-think how organizations must change, like a bumblebee in a hive, giving way to the term bumblebee economics. They seem to be at ease and having fun when challenging incumbents, questioning the status quo, and achieving drastic change. They reject the traditional notions of business, such as the industrial model and traditions of incremental improvements and optimization. These leaders aspire to build companies with scale and scope at unprecedented exponential speed. In the top right corner of the chart above, you can see some of today’s popular technology companies. These companies are the unexpected lethal forces in the global automotive industry today. Each one has a different take or vision about the future of mobility. 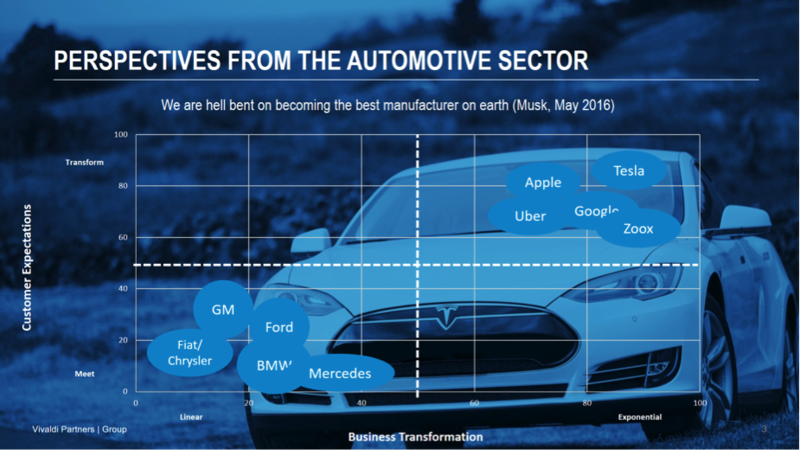 Each one of these companies is on a unique path to change the automotive industry as we know it. While Apple and Google have no intention to build cars, they each have a vision about how people will get from A to B in the future. Apple characteristically keeps its “Project Titan” under wraps, while Google bets on fully autonomous driverless cars. Uber’s well-known business model competes with taxis and limos, but it owns zero cars, employs zero drivers, and already launched the first run of autonomous cars in May. Tesla aspires to build cars en masse, but does so with a revolutionary approach – combining electric cars, charging stations, and batteries, while also rejecting the traditional notions of marketing or selling through dealers (against the law in most of the United States, one might remember). While there are likely to be a number of “pivots” yet to come from these technology companies, it is equally likely that they’ll find a way to rip up the industry’s supply chain and capture a significant portion of future profits. Like Usain Bolt, these challengers are marching – that is, sprinting – to the beat of a completely different drum. Apple and Google have so much cash on the balance sheet, they could buy the three largest American car manufacturers in a blink, and get another as part of a bonus package. The market cap of Uber went from $13 billion to nearly $70 billion in just three years. For the same amount, Uber could buy BMW, who just celebrated a 100-year anniversary, and Uber would still have $20 billion left over. You might think this sounds like an extreme case of drastic change, but I could describe the same situation with nearly every other major industry. Why is this happening? The problem is that many of today’s leaders focus merely on improving customer experiences or pushing customer-centricity initiatives across the organization. They map customer journeys, touchpoints, and shopper paths. They go from single channels to multi-channels to omni-channels. They launch new brands, sometimes even in competition with their core business, or they reposition and rebrand. Marketers, forever in fear of missing out on the next big thing, talk up anything related to digital, programmatic, content, native apps, Big Data, AR, and VR – but all too often get mired in the tactics of digital marketing, advertising, or customer-relationship management. At best, they pursue incremental strategies to convert or retain more customers more efficiently. At the other end of the C-suite, executives launch digital transformation efforts, and deploy enterprise cloud-based technologies to upgrade the IT infrastructure. Senior executives proclaim their strategic intent of becoming a software or technology company. They hurriedly set up venture funds and invest in promising startups; they visit Silicon Valley to admire and learn from the ecosystem of companies up and down the California coastline. They launch business transformations to become more agile and flexible, more nimble and responsive. And time flies by as executives fill their days managing these projects to improve, to optimize, and to enhance. All of these efforts are worthy initiatives but none of these are truly strategic, disruptive, game-changing, or bold enough to create the future; to truly change customer expectations and create new value; or to battle disruptors that seem to pop up like springtime crocuses – everywhere you look. The problem with so many of these major initiatives and projects (or call them “business and digital transformation efforts”) is that they are downright worthless in today’s economy. We call it the bumble bee economy. 1) Consumers adopt technology at an exponential rate. It took 38 years for 50 million consumers to adopt radio; 13 years for television; 9 months for Twitter – and only 80 days for the iPad. And while consumers are adopting these new innovations at an accelerating rate, they’re also discarding them just as quickly. 2) Consumers have become active problem-solvers. They set goals, pursue a set of tasks to achieve these goals, and make decisions in spite of constraints like time and money. They hire technologies, source friends, and seek help to get the daily job done. They look to optimize and become efficient and effective decision-makers who seek value and utility from products and services to manage their lives. They are no longer the gullible consumers of the Mad Men world. 3) Consumers power through search, evaluating, buying, and using products and services in an erratic, zig-zag, sporadic and peripatetic way, jumping from brand to brand, channel to channel, and device to device – all while they are taking care of what really matters to them, much like a bumble bee goes about life. The customer journey has become a sprint with a thousand turns. 4) Consumers today are distracted. Their attention has become the most valuable and scarcest of currencies. The attention span has declined from 12 seconds in 2010 to 8.25 seconds today – below that of a goldfish (or a bumble bee, in fact) – while an ever-increasing amount of information further creates a bottleneck on consumers’ time and deliberation. What if NYC taxi drivers started a major initiative of improving customer experiences – enabling more friendly drivers, for example? In the face of competition from ride-hailing companies like Uber, Lyft, and Gett, improving service quality clearly wouldn’t help much. Consumers simply would continue to order their cars on their smartphones instead of trying to hail a taxi from the curb. What value was there for Blockbuster when facing Netflix’s home-delivery service, sending films based on customers’ preferences provided online (and the ensuing ability to stream)? Blockbuster enjoyed huge success by converting dimly-lit video rental outlets into a nationwide network of 9,000 store locations with well-organized store ambiance, comprehensive video selection, and the helpful assistance of 60,000 employees. And yet, Blockbuster filed for bankruptcy in September of 2010. Nokia was the global mobile phone market leader with nearly $75 billion in revenue and a market cap of about $245 billion. Not only was it the strongest brand in mobile phones, it was the most innovative technology company in all of Europe. It had even invented and launched all major mobile technologies before Apple launched the iPhone in 2007 – including browser capabilities, Nokia glasses (like Google Glass), an app store, and an internet tablet (later known as iPad). It had video functionality comparable to FaceTime from Apple, and it had a low-energy operating system called Symbian. It even launched the N9 Communicator, a smartphone, long before Apple introduced the iPhone. Still, what value did Nokia have as a brand, despite its large user base and market share, once the iPhone arrived on the scene? 1) They radically rethink and reimagine the future of their industry – not merely their own market position. These leaders don’t just analyze trends and project them forward. And they don’t just develop a vision about the future of their own company. Instead, they envision the future of all markets in this bumble bee economy. The process begins by mapping consumers’ goals, activities, and daily life, as experienced minute-by-minute – or even moment-by-moment. The objective of this first part of the process is to create a landscape of what consumers solve for, the jobs they need to get done, and the context in which they make decisions, creating realistic, present-day life maps. In a second step, they explore the impact of key technologies and other factors that potentially alter these consumers’ daily lives. We use an imagination process involving the key question prompt of “What Happens When?” By engaging experts in imagining that future based on realistic, present-day life maps, we can build a fairly accurate picture of how value and utility are created in the future. What happens when there are 24 billion connected devices and only 7.8 billion humans? Or, speaking directly to the current situation in the automotive industry: What happens when the cost of the LiDAR sensor technology behind driverless cars drops from $70,000 five years ago to just $10 in 2020? How will consumers value the potential benefits and cost savings of owning a driverless car? The average annual car costs will drop from $9,000 to $2,000. What if a consumer could reduce by 26 minutes the daily commute with a car each way to work? Making the new trip – five days a week, 50 weeks a year, for 139 million workers – means Americans will commute a total of 1.8 trillion minutes. That’s 29.6 billion hours or 1.2 billion days. If we could make these minutes more productive for consumers, how much would they value the time saved? On top of all of these benefits, driverless cars can save 1 million deaths a year, 15 million injuries globally, and economic damages of $500 billion a year – not to mention the environmental perk of zero emissions from electric cars and other planet-saving benefits. Reimagining markets will involve creating a comprehensive and clear vision of the tangible benefits and utilities for consumers in their daily lives. Reimagining markets will not be about creating grandiose visions or audacious goals or creating a new brand purpose. 2) Leaders re-evaluate their business, their strategy, their processes, and their culture – not just the business model. They consider the technologies that enable the scope and scale of its operations at an exponential speed – not just the enterprise technologies that enable linear growth. LiDAR technology is one such exponential technology; another is the social platform that helps realize and leverage well-known network effects. One of the major reasons why these leaders consider exponential technologies is that these technologies don’t merely enable more agile and faster organizations. They evaluate them because of their impact on the value and utility delivered to the customer, as shown in the example of car-ownership cost reduction. These leaders know well that merely enabling the organization to be digital with incremental improvements in customer-centricity, retention, and acquisition is not enough. 3) Successful leaders find a way to translate the market impact they are seeking with consumers (Step #1 above), along with their organization’s capabilities (Step #2 above), into a way to transform customer expectations in their favor and create a truly powerful, new brand promise. This isn’t achieved simply by commissioning a customer journey or consumer touchpoint mapping initiative, or creating a new customer experience guided by design thinking. Instead, the leaders leverage that exponential technology to create a totally new value proposition and promise to its customers. If Uber indeed succeeds in launching a fleet of driverless cars, it will save nearly 80% of the operations cost currently paid to its drivers. It reduces the average per-mile cost of a taxi in San Francisco from $6.84 to about $0.35 – an exponential value creation through cost savings. In short, reimagining the future from the perspective of the bumble bee economy can unleash enormously powerful value creation and economic prosperity for companies – while also creating exponential new value for consumers and brands. Erich is a rare combination of consultant, entrepreneur, academic, researcher, author and positive contrarian. 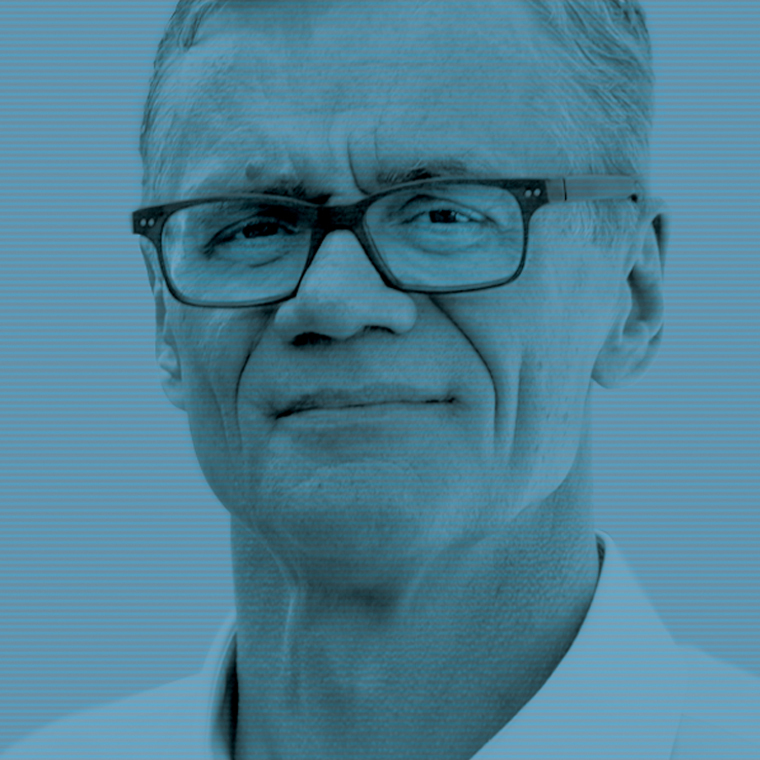 Over the last eighteen years, Erich has led Vivaldi in helping companies build strong brands, find innovation and new growth opportunities and realize them in today’s digital age. Is This the End of Branding as We Know It? Every quarter, we share our latest thinking and highlights as we write the next chapter on how brands, businesses and people grow.